The Entertainment District in Rosemont, Illinois is the new home of Kings Lanes & Lounge, a 30,000-square-foot retro bowling center with 1960s-style decor. Kings Lanes and the Five Roses Pub are the first of eight venues in the 200,000 square-foot district scheduled to open this spring and summer. The May 2nd grand opening hosted a variety of VIPs including Rosemont Mayor Bradley Stephens who with Kings owner Patrick Lyons (pictured above), cut the opening ribbon and rolled out ceremonial first balls in the celebration. Also on hand was Chicago Bears Cornerback Charles Tillman, whose foundation fundraising event is scheduled for June 7th at Kings. 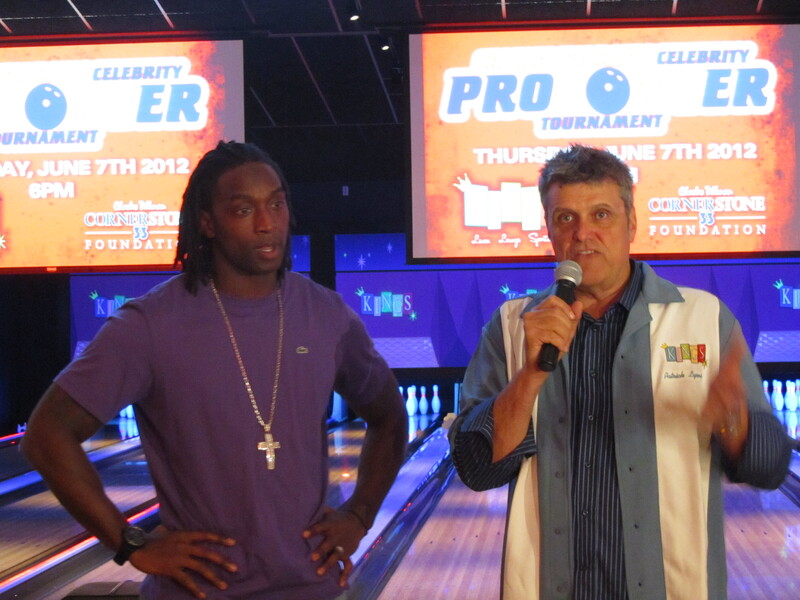 Lyons announced that in addition to the bowling event fundraising, a portion of all initial rental shoe profits will also be donated to the Charles Tillman CornerStone 33 Foundation. The 20-lane center is a US Bowling Corporation project, and features their mega media masks in a private bowling area. The center is also equipped with 20,000-watt speakers that can be customized for each space, four disco mirror balls, a billiards lounge and more than 60 high-density LED television sets. The 200-seat restaurant, lounge and bar are limited to patrons 21 and older. Lyons is co-founder and co-creator of the Chicago House of Blues. His precursor to the Rosemont Kings Lanes and Lounge is the highly successful Kings Back Bay in Boston, which boasts 16 tenpin lanes, three bars, billiards, skeeball and shuffleboard. Kings Lanes Rosemont is Lyons 3rd venture into bowling, with more centers planned.